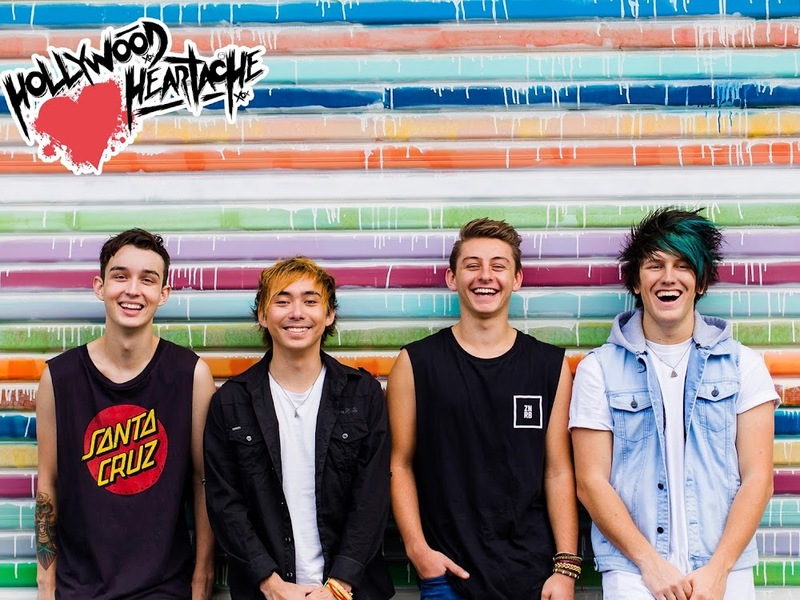 Hey, if you recall a few weeks ago, I featured am Australian band called Hollywood Heartache. Well I've been lucky enough to get an interview with them. 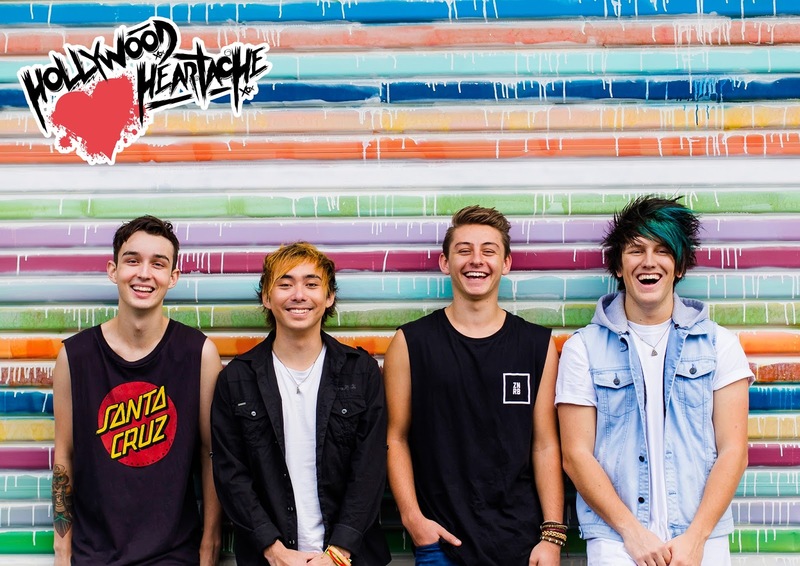 They are currently touring in the UK with Room 94, get tickets HERE. So here you go - the interview! For the sake of my readers, please can you introduce yourselves? AJ: Hey guys my names AJ. Oh and I like long walks on the beach. KEVIN: AJ, I’m quite sure she asked nothing about walks on a beach… anyway I'm Kevin. WILL: Hello, I'm Will. Only because AJ brought this up I'd like to add that he likes more than just walks on the beach. He loves anything water related. When we’re touring he wants to stop anytime we see a beach. Which in Australia happens a lot I swear the kids a mermaid (everyone but AJ is now laughing uncontrollably) errrr I mean merman. Whatever, you know what I mean! JOSH: Hey, thanks for taking the time to interview us. My names Josh - I bang on the drums! Your band formed only in 2014, how did you all meet? KEVIN: Well actually it's really not that exciting of a story, but at the same time it's really a major part of why we work so well together. WILL: Yeah, Kevin, myself and Josh all knew one another. AJ’s joining the band was a bit different. AJ: Wow man, don't make it sound all weird! I was thinking about learning how to play the guitar, only problem was that I didn't own one. So I was searching around on the net looking for a good deal on a used guitar and somehow came across an ad for a band looking for a singer. So I said heck with the guitar, my voice will be my instrument and I hit up the boys. Who came up with the name ‘Hollywood Heartache’ and were there any other names that you considered that you can share? WILL: Yeah we were all sitting around one night tossing around ideas and the Hollywood part came up straight away. KEVIN: Yeah, Hollywood just made sense, I mean when you’re a kid you always hear about going to Hollywood to become successful and what not. AJ: I can't really add anything here. The band was already named when I joined. JOSH: We really wanted a name that people could relate to in some way. Everyone has or will most likely experience heartache at some point, so we added that to Hollywood. Who inspires you in your music and have you ever met them? KEVIN: I think I can probably answer for all of us, we were actually just talking about this. We are inspired by all sorts of musicians really, I don't think any of us could pick just one or two. We have so much respect for all artists is every genre of music. I'm inspired every time I hear a story about how someone that's massively successful now started by recording YouTube videos in their bedroom. AJ: Yeah Kev’s spot on with that. Who writes your music and do you all have some input? WILL: We're very open minded when it comes to what we record. Sure we absolutely write a lot of material, but at the same time we are always open to listening to demos of songs people have written. We're actually getting ready to record a new song that an amazing songwriter/producer wrote. This guy has some crazy credits, I can't wait to be able to tell everyone more about it! JOSH: I'm pretty sure you just told them more about it that you were really supposed to. AJ: He gets excited very easily. KEVIN: AJ, you get excited when you see water, and you say Will’s easily excited. Seriously get AJ a kid’s sizes swimming pool and he'd finish the interview from there. Do you have any plans for an upcoming album? JOSH: Yeah for sure, I mean a lot of people don't really know what goes into putting out an album. AJ: Yeah I totally agree, to end up with say 12 or so songs for an album we would most likely record somewhere between 40 and 60 demos to pick those 12. KEVIN: Being in Australia it’s obviously a bit different than being in London, New York, or LA. By that I mean the talent pool is a lot smaller in Australia because we have a lot less people living there. Don't get me wrong we have worked with some amazing people in Australia but when it comes to working with people in other countries it can be pretty time consuming. WILL: Seeing as how I already said too much about an upcoming single I guess I'll just go ahead and explain the process a bit. It starts with the band and our Manager looking for great songs. In this case our Manager showed us a song that we all knew right away we wanted to record. Our management is in the US and this particular songwriter/producer is also in the US. So we start by recording all of the vocals and instrumental parts here in Australia. From there they get emailed to a vocal producer in Boston. He starts to produce the vocals and whatnot, during that process he may ask us to re-record something or sing something a bit differently. So we record the additional vocals he's asked us for. Once he's happy with the vocal production that gets emailed to LA where the producer who created the track mixes in our instrumental tracks and adds whatever effects and whatnot he thinks make the song sound great. In this particular case we’re working with two producers who both are amazing and between them have platinum albums, number one singles, and have really worked with some of the biggest names in the industry. KEVIN: Yeah we're really excited about teaming up with these guys, but to finish what Will was saying once the producer in LA is done doing his thing it all gets sent back to Boston for a final mix and master. So as I'm sure you can understand that process can take a bit. It’s important to all of us to do this the right way. We don't mind spending a little more time recording this way. In the meantime we still record some covers here and there to share with fans or post clips from shows. AJ: At the end of the day we want to release amazing material. Our fans are amazing and we owe it to them to put out music that is professionally produced. I wouldn't feel right asking fans to buy our music otherwise. You have a large fan base on social media, with nearly 50k followers on Twitter alone. How are you coping you dealing with the fame? KEVIN: Our social media numbers are something we are extremely proud of. We've worked very hard to build our fan base. It's no secret that some bands pay to make it look like they have more followers than they actually do. I can honestly say that we have never once paid to inflate our social media numbers. WILL: I definitely don't think any of us think we're famous. That's funny though. JOSH: Yeah until people are camping out on my mum’s lawn I’m not going to feel famous. AJ: Heck with you guys, I love being famous and I handle it extremely well. I only travel with an entourage of 5 people. I’m definitely kidding, I agree with the boys. I’m not really sure when you find out your famous. Do you get something in the post? What’s the most interesting thing you’ve ever received from a fan? AJ: We had a really young fan make us little Minions with our faces on them, they were pretty awesome. JOSH: Those were definitely cool but I think the most amazing thing from a fan was actually from Kev’s Grandmother. She bought our tour van for us. WILL: Yeah, I totally agree. I didn't even think about that. I mean our families are our biggest fans/supporters. Without them none of this would be possible. KEVIN: I wasn't even thinking about it like that. But yeah our families are amazing and when my Grandmother purchased the tour van for us I was speechless. I don't know that I'll ever be able to thank her enough for that! WILL, AJ, JOSH: Thank you Kevin’s Grandmum! What do you like to do in your free time, other than music? AJ: Sleep, yes definitely sleep. Well I guess when I’m not sleeping I’d go for a swim! KEVIN: Sleep for sure. I’m also really into the production side of things, when we have free time I really enjoy messing around with Pro Tools and trying new plug ins. WILL: I think you're seeing a trend by now but absolutely sleep! JOSH: Heck with them, I prefer to spend my free time entering Iron Man events. After a serious long nap of course. AJ: Iron Man HA HA HA! You'd pass out before you made it to mile 1 on the run! Each tell me one embarrassing fact about a different member of the band? KEVIN: Let's save that one for the next interview! So as you noticed, there is more coming up with these guys so subscribe to my blog or follow me on Twitter so you don't miss it!